Stevenson, Richard. “The Last Thing I Saw”, MLR Press, 2012. 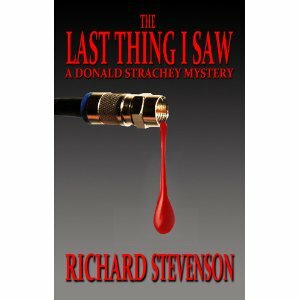 Donald Strachey returns in this, Richard Stevenson’s, newest book. Wenske is a popular newscaster and investigative reporter who has written a very successful coming-out memoir as well as a book about drug cartels that has put many dealers in precarious situations. He was investigating a gay media conglomerate whose owner is considered to be a shady character who conducts business “his way”. Strachey starts looking for him and his search takes him to Boston and New York City and eventually to California where he discovers that the world of the media not only is not glamorous but that it is very, very dangerous. Stevenson’s Strachey has become on of gay literature’s heroes and icons and this is not just because Stevenson is such a good writer but also because several successful movies have been made from his books (by a gay media conglomerate that has had quite a shady life). He is a loveable detective and a larger-than-life character who we have been able to read about as he matures. However, it is almost impossible to write about Stevenson’s plot without spoiling the read for others and therefore I am not going to say anything else about the plot except that the author has once again built a story that will take you from the world as you read. One of the things I really like about Stevenson’s writing is how he manages to make each story different as he shows us a side of gay life that we do not often see. Each of his books is a look at gay life and Strachey and Stevenson have developed quite a following. I just hope that we will follow the series for many book books.